Writers must learn to embrace solitude in order to achieve their writing. This is true for all those who wish to achieve something creative, no matter what the field; however, it does seem that those in the nonperforming arts require a degree of solitude that tends, at times, to weigh heavily, and can be most discouraging. I find meeting and visiting other artists inspiring not just in terms of firing me to push forward with my own projects, but in helping me bear solitude. Every writer and artist I have ever met, it would seem, has helped me that way, and most recently, my thoughts turn to a wonderful studio in Jeddah, Saudi Arabia, that I was fortunate enough to visit during my recent trip to the kingdom. 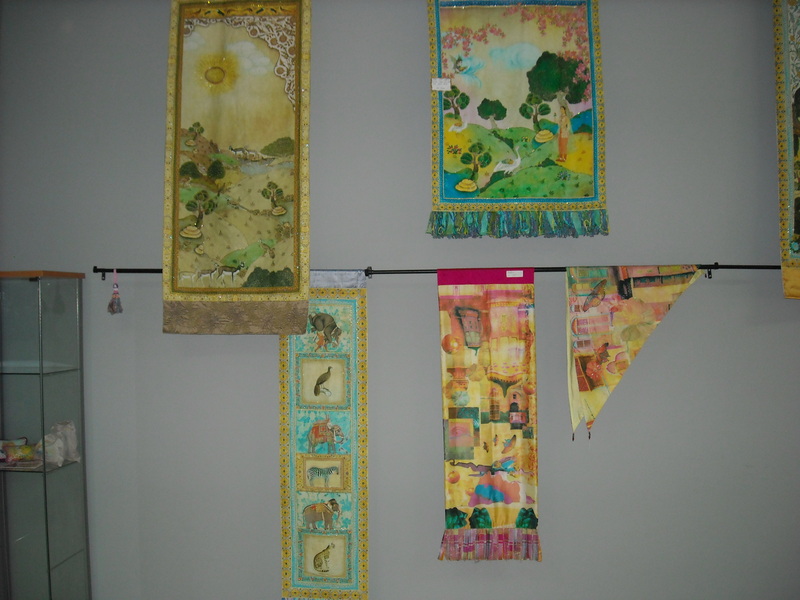 Debra Ann Dennis has been a friend for many years, but I had only heard about and seen pictures of her quilting studio. During my recent visit, she invited me to stop by. 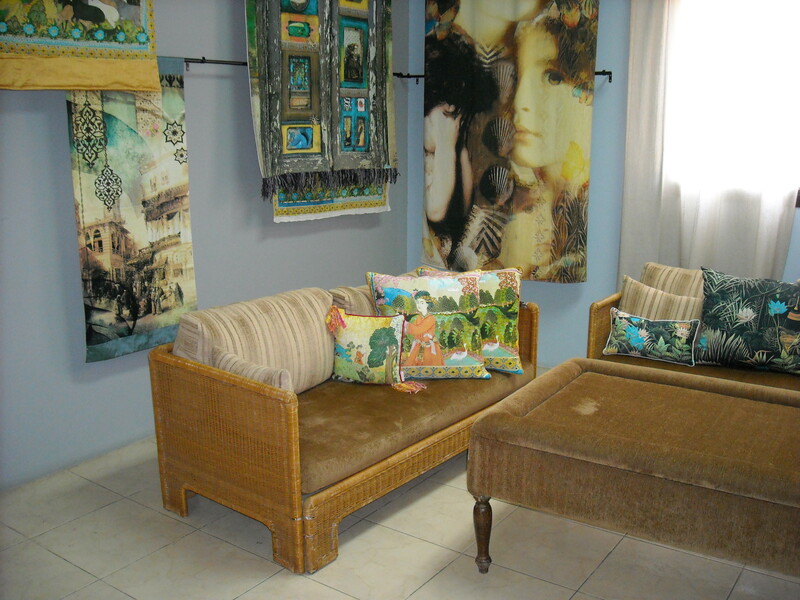 I found a villa that had been transposed into a workplace for two artists: Debra and her colleague April Tosch, another American textile artist who has taken the second floor of the same villa to design, produce and display block prints upon silk. Both women produce incredible, perfectionist work. These two textile artists have known multiple solitudes: that of being foreign wives in countries far distant in culture,time and space to their native lands,of being female entrepreneurs in a society which is very difficult for Western women to flourish in, and finally, being artists who must, like every artist, learn to wrest learning, thought and accomplishment out of long, silent hours spent alone. Such visits really encourage the spirit. Today I am thinking of April Tosch upstairs in her own studio with a huge blocking machine, admitting to me that she taught herself. She was all alone there. 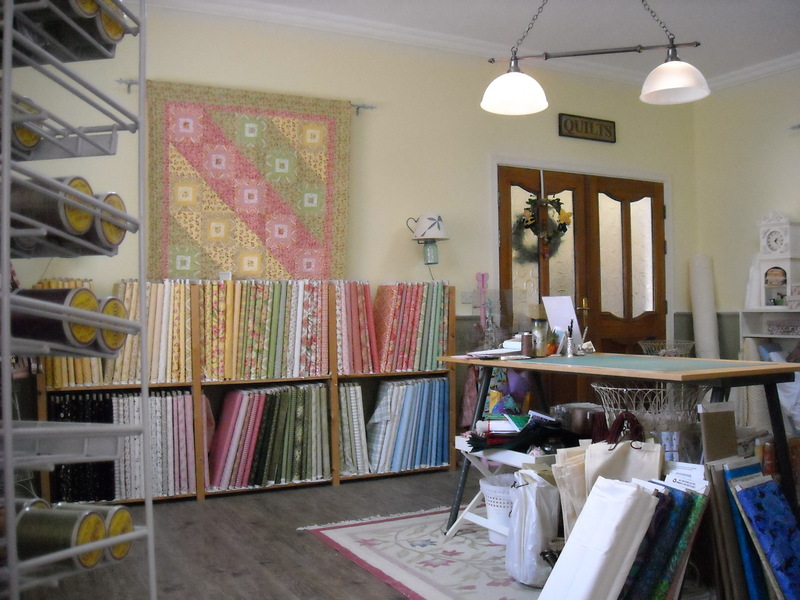 I think of Debra Ann Dennis’s well organized rows of pretty fabrics and the one lady customer I met there, an Egyptian, whose life has clearly been imbued with meaning through bonding with Debra and her quilters’ guild. I believe I will be thinking of these ladies all year, and would like to thank them. Their examples will help me to get my own work done. How far will digital technology for writers evolve? Despite maintaining this blog with Julia, I’m far from tech savvy when it comes to marketing myself in this digital age. As writers, we have a constantly expanding social universe to explore: Facebook, Twitter, personal blogs, phone texting, business-related internet groups such as LinkedIn. If I put in the time, I could probably have a decent presence on all of these sites; trouble is, I wouldn’t have any time left to actually write. I’m hoping that in the future we will be able to prepare one site (such as our blog) that we can upload to all of these other sites with the push of a button and all of our info will automatically be put into the right slots. Maybe that will happen sooner than I think. When I compare the growing trend in E-books and digital publishing, I’m reminded of the transformation in the music business that has been taking place since the early 1990s. People held back on embracing the MP3 format for a long time, even though the technology was available. I can remember offering to get both our girls MP3 players for Christmas one year, to which they rolled their eyes and snorted. They wanted new Walkman’s, like all the other kids had. Today I purchased my first MP3 album from Amazon, something I have been resisting for years. I’m from the old school of 45 singles and LP records. I eventually embraced CDs because they are durable, portable, and a space saver compared to those large 12-inch LPs. And, a bit like records, many come with color booklets reminiscent of the old album inserts. (I might need a magnifying glass to read them, but still.) And, best of all, I can hold the CD and case in my hand. An MP3 “album” is nothing more than a downloaded file. There is nothing to “hold on to.” It arrived on my computer in a matter of minutes. I can see its little icon on my desktop. If I want to listen to the songs, I open Media player and click on the title. Fine, as long as I’m sitting at my computer, but what if I want to listen in my car? Or outside while I’m gardening? Well, then I pop in the just created CD that I burned from that download. Or, I copy the whole song list to my I-Touch and listen on that. A digital download gives you multiple formats, including the all-important “I can hold it in my hand” CD. There’s no fancy label, no color insert—but I can make those myself with software and a printer if I really want them. Best of all, the MP3 versions often come with extra songs not found on the retail CD. And they cost less. Another plus for music sold this way is that buyers can purchase a single song, a few songs, or the entire album. Most songs can be “previewed” for a 15-20 second listen so you can pick only the songs you want. A dollar a song on Amazon. It’s hard to imagine that working for E-books—the dollar a song bit, I mean. Free chapters, or at least excerpts, are offered on Kindle and most other E-book sites, but we can’t very well sell our books chapter-by-chapter, now can we? Then again, who knows what the future holds. I continue to be amazed on a daily basis insofar as what my Smartphone can do: internet, GPS, email, texting, photos, games. I play Words with Friends, a Scrabble type game with my daughter Katie, who lives in San Diego. I take a Father’s Day photo of her dad sleeping on the couch with our dogs and send it to her under the header “Dad napping with his boys.” My other daughter, Carrie, sends me a picture of an Elvis painting I did years ago which remains on display at Graceland (“Taking the tour with Mike. Look what we found, Mom!”). Everything is incredibly instant, that’s the thing that seems hardest for me to adjust to. But I’m getting there, a day—or should I say an hour—at a time. Whether emotion is a plus or minus in our writing is always debatable, at least in fiction. As writers, we want our readers to feel what our characters are feeling: love, hated, anger, joy, sadness. But it’s a touchy business. Too much emotion and our characters seem more like caricatures. The hateful villain with no good qualities, the selfless hero who never thinks of himself, or the ditsy heroine who never thinks, period. None of these stereotypes make for good characters. No villain can be all bad, no hero all good. It’s our job as writers not to force the issue, to allow our characters to develop as the story progresses so that readers will find them believable. In non-fiction, on the other hand, the less emotion the better, unless you are writing a memoir or autobiography. Our job as non-fiction authors is to present readers with a set of facts regarding our subject matter. We aren’t there to make conclusions, to judge the subject(s) in a positive or negative manner. This is the approach I used in both Hoop Lore and Elvis Presley, Richard Nixon, and the American Dream. It wasn’t always easy, as I feel passionately about both Elvis and the NBA, but I do believe both books are better because I used a neutral approach. In the Elvis/Nixon title especially, I felt it was important to allow readers to reach their own conclusions as to whether either or both deserve the reputations they carved out in American history. Given my stance on emotion in writing, I am opting to create a spin-off blog here on WordPress that will consist of personal musings on whatever topic I feel like writing about on any given day. Some of it will be vaguely writing related, though I will continue to use this space on Grassroots Writers Guild for the majority of those posts. As you can see by our sidebar, we have grown tremendously over the past year. There has to be a line drawn, and I am doing so today. I will be posting a link to my new site on the sidebar of all my pages for those of you who want a more personal look into my life, not just as a writer but as an animal lover, an Elvis fan, an NBA nut, and a gardening addict. 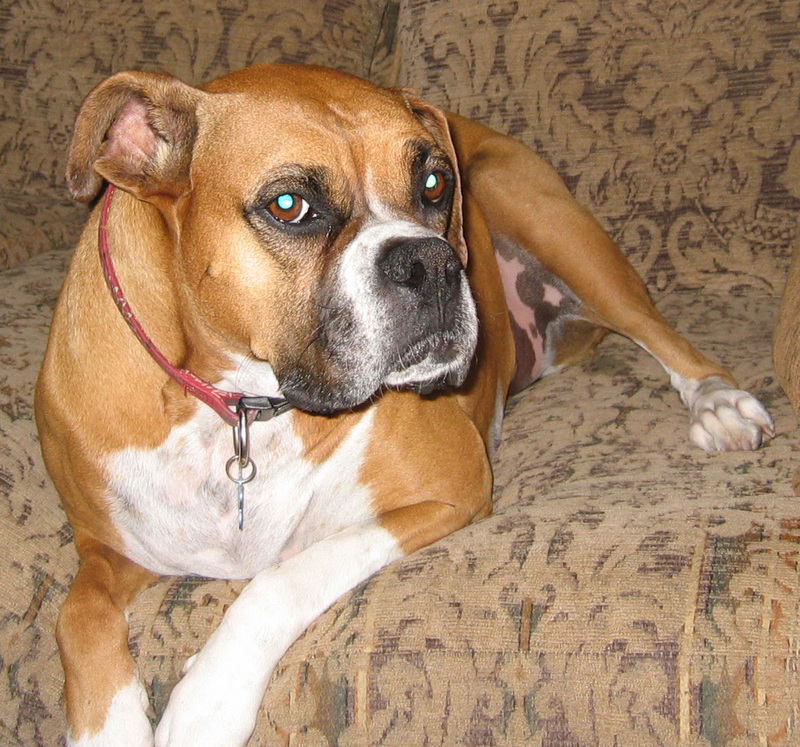 Since I have yet to launch my new site, I am going to use a bit of space here to post a photo of Java, our beloved boxer who crossed over the Rainbow Bridge on Monday. Goodbye, my sweet, sweet girl. Say hi to Annie for me when you get there. I hope you two girls have a wonderful time together running and jumping and barking and playing. I love you both from the bottom of my heart.